If you happen to visit Riga ( Latvia ) you can find an interesting piece of history at the Riga War Museum. I did. It is the rifle of the Hero of the Soviet Union major Janis Voldemarovich Vilhelms - 201st Rifle Division-later 43rd Guards Rifle Division. The covering glass and the position of the rifle inside the display box at the Museum prevents from taking good pictures but anyway I tried to take few, so have a look at the "counter of Kills" on handguards [ according to different sources J.Vilhelms is credited from 150 to 211 enemy soldiers eliminated ]. Another interesting feature is the alternation of the stock - front handguards and just behing the trigger guards [ red circles ] made allegedly by J.Vilhelms himself to adjust the stock to his requirements. PEM scope is dated 1938, rifle serial number - ДМ 379. The worst thing is the method of demilitarization - a horrible hole drilled throughout the barrel ( chamber ) close to the receiver - what a moron diecided to do this that way ?!? 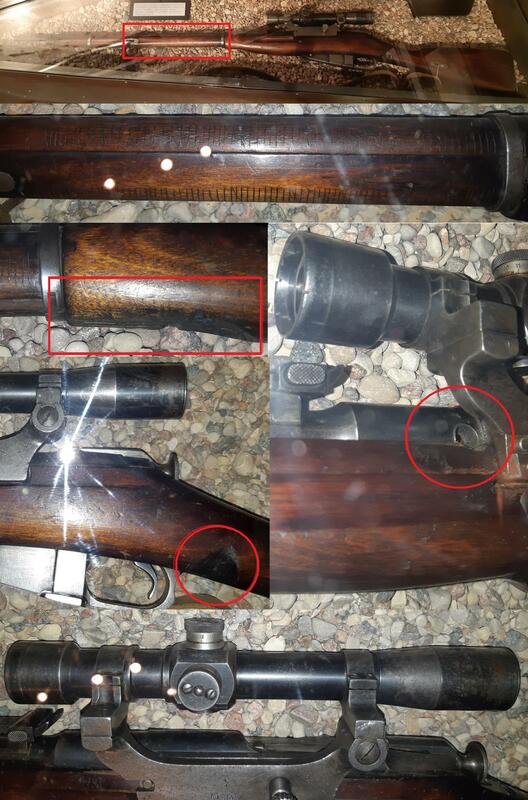 Great rifle with a great history ruined - pity. scottyb, russian_bot_5791, Gypsy and 4 others like this. Neat rifle, but the museum is incorrect in call it a Geco mount. Its a typical PEM style side mount. A Geco mount would have a range plate and wouldn't have split ring mounts. this is a Geco mount. Any problem can be solved with the proper application of high explosives, the trick is to not be around when they go off. Who in the hell would de-activate an old and historical warhorse like that? scottyb, Fiorentino and Miller Tyme like this. Finn Capture M91/30 Sniper. 1938 Tula PEM.